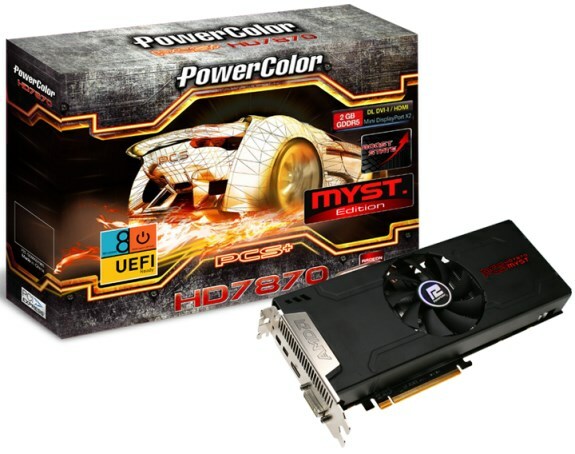 PowerColor introduces the PCS+ HD7870 MYST. Edition 2GB Edition, a new model with 925MHz core, 975MHz boost and 2GB GDDR5 memory clocked at 6000MHz. This is a new graphics card based on AMD's Tahiti LE GPU. Pricing and availability is unknown. TUL Corporation, a leading manufacturer of AMD graphic cards, added a new flavor into award-winning PCS+ HD7870 series: the PowerColor PCS+ HD7870 Myst. Edition. As an advanced version of PCS+ series, the latest graphics solution is introduced with evolution GPU design and solid-built “Gold Power Kit” onboard, enabling stable power efficiency even at load. The PCS+ HD7870 Myst. Edition clocks at 925 core speed and 6.0Gbps memory speed, by taking advantage of AMD PowerTune with boost, allowing the core frequency dynamically overclocked up to 975MHz, maximizing the platform setting to tackle all the demanding titles. Moreover, the latest graphics equipped with 92mm ultra large fan design, easily taking away the excessive heat from SSU-shape heat pipes fully covers the GPU, delivering the coolest entertainment experience. Engineered with support for all the latest technology, the PCS+ HD7870 Myst. Edition is well prepared for the next generation of gaming; with UEFI ready, this edition supports Windows 8 Fast Boot function, allowing a better user experience. Also, with AMD Eyefinity technology and AMD HD3D Technology, it supports multi-display stereoscopic 3Dcontent, delivering an immersive “wrap around” gaming experience.